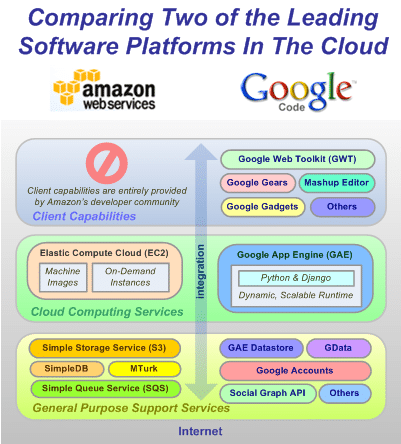 Platform as a service (PaaS) the delivery of a computing platform and solution stack as a service. These facilities allow customization of existing SaaS applications, and in some ways are the equivalent of macro language customization facilities provided with packaged software applications such as Lotus Notes, or Microsoft Word. Often these require PaaS developers and their users to purchase subscriptions to the co-resident SaaS application. Some PaaS offerings lack development, debugging and test capabilities, and provide only hosting-level services such as security and on-demand scalability. Lets the developer use any programming language, any database, any operating system, any server, etc. PaaS offerings typically attempt to support use of the application by many concurrent users, by providing concurrency management, scalability, failover and security. The architecture enables defining the “trust relationship” between users in security, access, distribution of source code, navigation history, user (people and device) profiles, interaction history, and application usage. Support for SOAP and REST interfaces allow PaaS offerings to create compositions of multiple Web services, sometimes called “Mashups” as well as access databases and re-use services maintained inside private networks. Support for keeping the user/relationships (if multiple users)/device context and profile through the mashup across web services, databases and networks. The ability to form and share code with ad-hoc or pre-defined or distributed teams greatly enhances the productivity of PaaS offerings. Schedules, objectives, teams, action items, owners of different areas of responsibilities, roles (designers, developers, tester, QC) can be defined, updated and tracked based on access rights. track activity based costs and revenues. Financial data collection and, possibly, forecasting, are required to determine who pays what to whom and when (how often).